Cuban Parrot (Amazona leucocephala) in Cuba (2007). Pet parrots. Most folks have the misgiven understanding that adopting a parrot means trouble. The general consensus is that if a parrot is up for adoption in the first place, it must be problematic. Naturally, like in every species of animals (including us humans), there are problematic parrots. However, it would be immensely naive to think that this is the primary reason people abandon parrots. FACT #1 - Parrots have a very long life span. In fact, some would argue that they're on the verge of discovering the secret to immortality. The small ones live for up to 20-30 years. Larger ones can go on to a ripe old age of 60-90 years. Just imagine: If the scheming investment bankers of Merril Lynch knew this, they'd probably convince the birds to buy a dozen retirement homes. My point is because of their lifespan, they tend to outlive their owners. As a result, many parrots at the rescue centers are only there because their previous owners are no longer in this world. Not because they're particularly ferocious. FACT #2 - It's not the parrots fault. I think it's safe to say that humans are the primary cause for most of the bird's problems. Here's why. Mr. New Fish suddenly decides he likes parrots. He thinks that they're gorgeous because of their amazing blend of colors. Also, he reckons that within a few days, he'll have his parrot on his shoulder, squawking instructions to imaginary pirates in his living room. So he buys one, purely on impulse. He does little to no research beforehand, and just dives in head first. So what happens? The parrot takes one look at Mr. New Fish and realizes that he's nothing but a nutcase. The problem is, the parrot can't actually tell Mr. New Fish this, because well... most parrots don't speak English all that well now do they? Although that's debatable, considering the insults certain parrots have hurled in my general direction. The parrot makes a mess, because it doesn't know better. The parrot sometimes shows signs of aggression because Mr. New Fish thinks that it's OK to poke it all over. What's next? Mr. New Fish, thinking his parrot is the one with the issues, ignores it. He gives it no attention, no affection and puts no effort in caring for it. Next thing you know, the parrot, along with the cage, is chucked in the deepest, darkest corner of the garage. So yes, the parrot will naturally go rather bonkers after this ordeal. But is it really at fault? Eventually, the parrot is rescued by a center. When people get married, have babies, or just have a new set of priorities in life, often times companion animals end up forced into the backseat. This has been the case with numerous parrots. Hence, they end up getting sent to a rescue center. FACT #4 - Some people are profit motivated. Pet stores and breeders have realized that parrots are flat out popular. So what do many of them do? They breed them like there's no tomorrow. They sell them without matching up the right people to their bird. The end result? 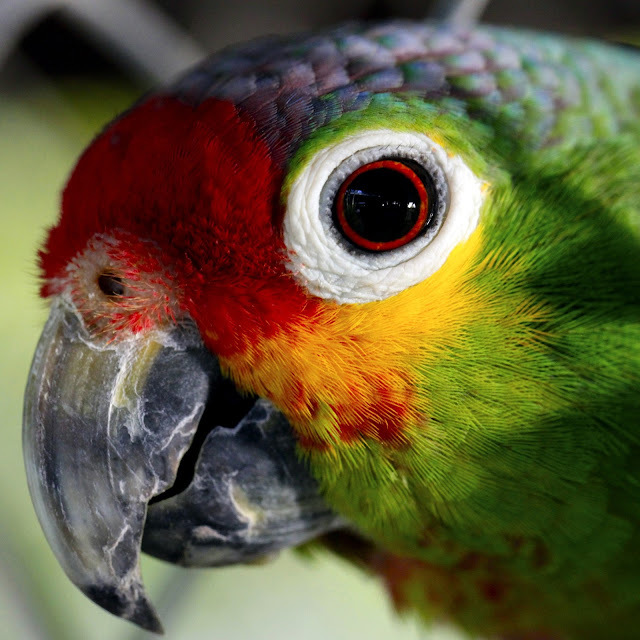 Too many parrots for potential owners to handle, especially in certain countries like the United States. So the parrots get treated like commodities, and a large number of these parrots end up in shelters. A disturbingly sad ordeal isn't it? I know. Now, don't get me wrong. There are many terrific breeders and even pet stores that I can freely recommend with a good conscience. But just like everything, there's plenty of not-so-great groups as well. Naturally, the best way to minimize this problem is to educate potential owners. All they really have to do is read extensively on parrot care, and do their part to spread the word (in fact, you might want to let people you know read this article). However, today I'm going to focus on what you can do to help right now. If you are looking into buying a parrot, you should seriously consider taking part in the parrot rehoming process. Here's a fact for you. Because of the explosive parrot breeding, rescue centers are flooded. A large number are filled to the brim, and even more are overflowing. Unfortunately, this results in a very nasty irony. Rescue centers can no longer give the parrots the necessary attention and care. They just can't. They are cash strapped organizations that are stretching their resources to the breaking point. As such, some rescue homes are no longer able to serve their purpose. Naturally, they're becoming just another vortex for these unlucky birds. If you're really interested in owning a parrot, let me take this opportunity of sharing a few perks of adopting one. Buying a large parrot (African Greys, Amazons, Cockatoos) from a pet store in the United States can cost anywhere between $3000 and $5000. Macaws are known to cost even more than this. It's a lot of hard earned cash isn't it? Guess what? Adopting a large parrot, like a Grey, would probably amount to no more than a few hundred dollars. The common misunderstanding is that parrots will only bond with you if you're the one who has been taking care of it since its adolescence. This is flat out wrong. In the wild (and your parrot is no different from a wild one), parrots may bond with several different partners in their lifetime, well into their maturity. Most parrots that are up for adoption are already somewhat mature. And if you take up a mature bird that came from a relatively good family, the main issue you're going to have is helping the parrot get used to you. Because when a parrot gets attached to someone, they mean it. Naturally, adopting a bird would be a huge help to the rescue organizations. They are in desperate need of help from people like you. And if you're able to provide a good home for a parrot, they'll be eternally thankful. Rescue centers are fundamentally sanctuaries. Many are equipped with the means to rehabilitate birds. And on top of this, they're not profit motivated. You're less likely to be scammed by a rescue home as opposed to a pet store. Naturally, the story has a flipside as well. 1) Some parrots are bound to have been overly neglected or even abused. As such, they may already be undergoing a great deal of mental trauma. And it can be quite scary. These parrots have an extra aggressive nature. They usually don't hesitate to bite the hand that feeds. Some even go on self-mutilating rampages. And if you're lucky, you'll see one that does nothing but scream it's lungs out. Don't forget though: Adoption is fantastic, but it's not an obligation. You don't have to adopt a bird that is in an extreme condition already. Go for one that would be easier to work with. However, if you have some parrot keeping experience under your belt, taking on a parrot with existing behavior problems and guiding him to become a friendly, social bird is immensely rewarding to both you and your bird. These birds were often the most abused and deserve a life where they are cared for and thrive. 2) Parrots are sociable animals. That said don't be surprised if they come with their own package of trust issues. You may get a little flustered if the parrot you adopt simply refuses to acknowledge your existence. However, don't forget: Just like people, parrots value trust a lot. They need you to give them a reason to trust you. But once you do, the bond may as well be forged by a goldsmith. When all is said and done, parrots are truly remarkable creatures. They're very intelligent and you can easily learn a lot about yourself around them. If you're keen on getting one for yourself, seriously consider adopting one. However, just with every important purchase, remember to do your share of research. This way, you will save both yourself, and your parrot a wealth of trouble. There are several birds that you can keep at home as pets. Bird adoption is another common adoption that goes on such as adopting dogs and cats. However, when adopting birds you must be prepared to take care of them, because unlike other pets birds need a lot of care. When you adopt birds you must be ready for feathers flying all over and in the case of certain parrots the mimicking of your voice. But birds do need constant care because you have to ensure you have put the right amount of bird food and water in the cage. Secondly, the cage will have to be cleaned out all the time due to the fact the bird poop should not accumulate. The cage must be kept outside, at least most of the day because it is not nice for the birds to be in the house all the time. However, if you do leave outside be sure the cage door can't open by mistake. Birds are some of the most beautiful creatures ever created. They have beautiful voices when they sing such as the mockingbird which however is very rare to have as a pet. There are few birds you can make pets such as parrots, owls and much more. However birds like hawks, crows, and eagles are not the kind you will find as home pets, they will probably be found in bird shelters. When people decide to choose bird adoption they must know what birds eat and drink as well as what is necessary to take care of the animal. This information can be provided via the internet or from your local bird center or sanctuary. Most birds like seeds and fruits. Peter Gitundu Creates Interesting And Thought Provoking Content on Pet Adoption.